Italy has a fierce attachment to food, and nowhere more so than Puglia – the spur on the heel of the country’s geographic boot. The region’s agricultural, maritime and pastoral history has left its imprint on the cuisine, which, above all, reflects Puglians’ self-sufficiency. 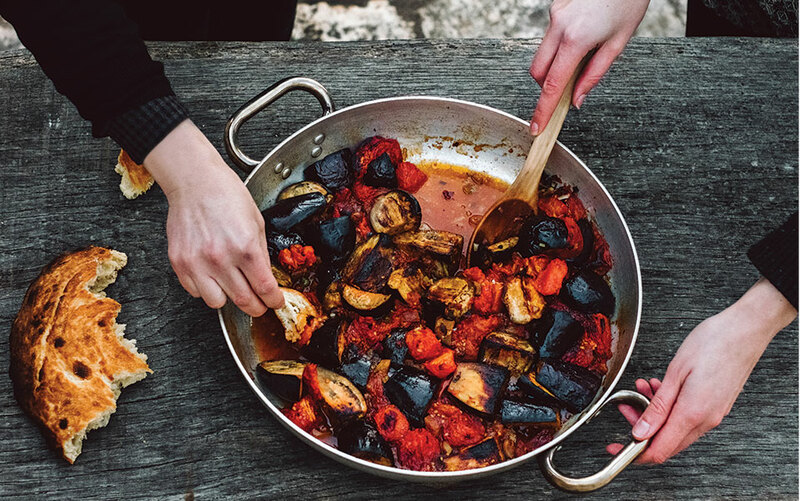 Known as the garden of Italy, Puglia’s land of shepherds, farmers and fishermen may be bountiful, but the region’s cooking style is proudly frugal, with many of its dishes borne out of necessity. Its historically poor infrastructure has givaen way to hyper-local produce and a seasonal diet. Puglians have been eaating farm-to-plate long before the term ‘locavore’ was even coined. This resourcefulness continues today, with locals making use of whatever is at hand when it comes to cooking, whether it’s easy-to-forage wild chicory or their neighbour’s sundried tomatoes. Nothing goes to waste. Pasta rotta is a dish made from broken, irregular bits of pasta, whilst surplus dough is used to make Puglia’s original street food: deep-fried Panzerotti bread. Regional favourites like Fava e Cicoria and Orecchiette con Cime di Rapa have their origins in cucina povera (a poor man’s feast), and stand out for their simplicity. But it’s not just what Puglians eat, it’s how they eat. Their tradition-bound habits stem from leaner times, when friends and family had no choice but to come together for regular meals to share the little food they had. This sense of community endures today, with villagers paying daily visits to their local fornelli (a communal oven) and taking their olive harvest to a neighbourhood press. Almost 80 per cent of Puglia’s population lives in rural areas – eating and living from the land and sea, as their forefathers did. Edged by 800km of coastline, this sun-drenched region’s long summers produce fruit, olives, grains, cheese and vegetables such as artichokes and fennel. And its fertile Tavoliere plain yields huge quantities of durum wheat, used to make its famous Altamura bread and orecchiette pasta, the region’s gastronomic symbol. The people of Puglia are a stickler for tradition, and family dining remains a ritual in this southern region. On Sundays (a customary day of feasting in Puglia), towns like Giovinazzo fall silent at noon as families and close friends gather around the table. It’s not just eating; food shopping, preparing and cooking all bring the family together. After a siesta (which is practically sacrosanct), locals will descend en masse to espresso bars that line Giovinazzo’s Vittorio Emanuele II Square. Puglians have the Greeks to thank for their 60 million, 2,000-year-old, gnarled olive trees. This region alone produces 300,000 tons every year and a quarter of Europe’s olive oil – known locally as the ‘Gold of Apulia’. Most residents like Teresa Stufano own a small orchard of around 400 trees, located out of town. Here, they harvest their own liquid gold with the help of neighbourhood olive presses like the family-owned Oleificio Fratelli Turturro, that has been working this land for five generations. It’s not uncommon to see local ladies hand roll orecchiette on a makeshift table in their doorways. Puglian nonnas (grandmothers) keep things authentic using burnt wheat flour in the eggless dough, which is cut, then deftly sculpted into saucer-shaped pasta nubs or “little ears”. Typically, the orecchiette is served with cime di rapa (a native broccoli) or with a simple passata sauce (homemade sieved tomato puree). Unlike other regions, Apulian’s tend to mix the pasta in with the main course. The era of oven-less kitchens in the region may be long gone, but Puglians continue to congregate at communal village bakeries-slash-ovens (fornellis), as their grandparents once did. Locals pile into Giovinazzo’s Antico Forno Polacco, where earthenwear vessels of Patate riso e cozze, olive-encrusted focaccia and jugs of chickpea casseroles are shovelled into the century-old, two-metre-deep wood-burning stove. Trays of Frisedde (dry biscuits traditionally eaten by sheepherders) are stacked alongside the famous four-ingredient, knotted loaves of Altamura – said to have a shelf life of up to two weeks. Puglia, which lays claim to some 100 varieties of bread, didn’t get its nickname “the breadbasket of Italy” for nothing. The key ingredient to Puglian focaccia is the humble spud – mashed to yield a softer and denser texture. This delicious version uses juicy plum tomatoes from a farmer-friend, lashings of olive oil, fresh oregano and olives. The secret to this lattice-topped ricotta cheesecake, Teresa tells me, is using the freshest sheep milk you can get your hands on. Another locally produced cheese worth trying is Manteca (a Puglian invention), made from stretched curd filled with a ball of butter. Nolca or an equivalent variety of sweet black olives are seasoned with garlic and a pinch of chilli, before being fried in a splash of olive oil.